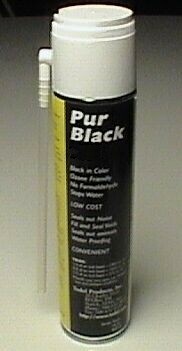 PRODUCT DESCRIPTION: Expanding black foam which can be painted. Designed for filling spaces, gaps, cracks and crevices on most any structure, this professional caulking compound is as good as it gets. It even seals holes where rodents maybe entering your home. Supplied with an attached straw, it dispenses a 3/8" bead 1025 ft long. It will dry tack free in just 20 minutes and cures in 24 hrs. The larger 25 oz can (must be used in one of the dispensing guns) will disperse a 3/8" bead over 1500 linear feet. RATE OF APPLICATION: Coverage will vary from job to job. It's easy to underestimate just how deep voids or spaces may be so be sure to get enough. The 16 oz can comes with it's own injecting hose and is ready to use. The 25 oz can does not come with a hose and must be used with one of our Injection Guns. TIPS ON "HOW TO BEST USE FOAM SEALENT"